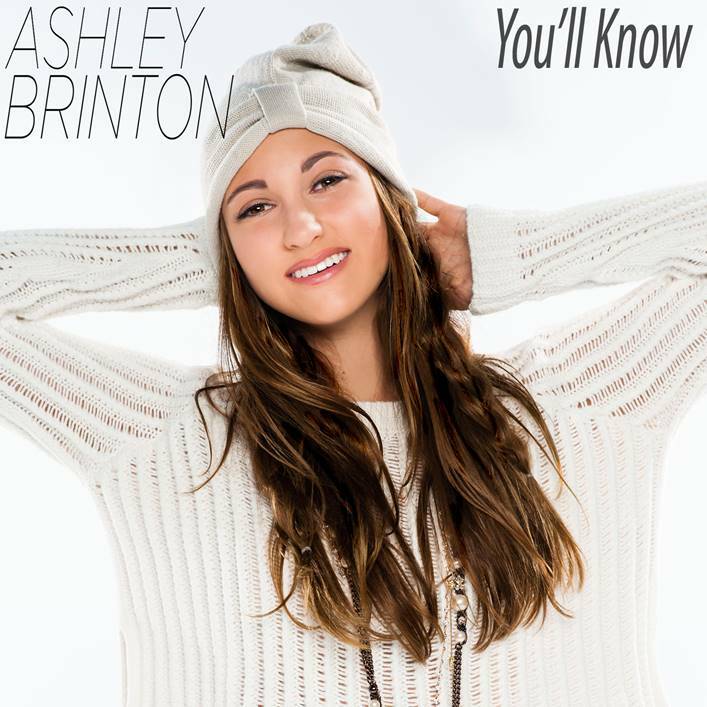 With a newly released single and music video titled “You’ll know”, 13 year old singer/songwriter and actress Ashley Brinton is ready to take the world by storm. In just a year’s time, Brinton has launched an impressive acting career, landing high-profile roles in national television commercials, major motion pictures and music videos. Her latest video also features Disney Channel star Jake Short. Ashley will make her big screen debut in the thriller Broken Vows, a psychological thriller starring Wes Bentley and Jaimie Alexander scheduled for release later this year, where she plays the role of Daisy, who is the flower girl and sister of the film’s bride-to-be. The South Florida native has also appeared in Animal Planet’s World of Dogs. Ashley’s extraordinary vibrant stage presence, coupled with her lively “girl-next-door” personality have all enabled Brinton become one of the most sought after teens in the acting world. At a very young age, Ashley developed a love for acting. Inspired by her idol Natalie Portman, she played the role of Lucy in West Palm Beach’s prestigious BAK Middle School of the Arts’ production of You’re a Good Man Charlie Brown. Among many lead roles in the Boca Raton Theater Company’s productions throughout her early childhood, she landed the role of Christine in the Boca Raton Children’s Theater production of Phantom of the Opera, where she garnered the audiences’ acclaim for her flawless vocals and performance. It was crystal clear to her parents, her peers and her various audiences….this girl had a gift, and it was time to begin her professional training. TeenInfoNet got an exclusive interview with the rising where she explained to us all about her new single, working with Jake Short, upcoming projects and much more! Be sure to check out the interview below and learn more about Ashley at AshleyBrinton.com. -We love your new single “You’ll Know”, what was the message behind the song? -How did you come up with the concept behind your music video? And how was it working with Jake Short? Working with Jake was amazing. He is the sweetest, most polite guy on the planet and is really funny. We had a blast working together, and I won’t forget this experience any time soon! -You’re also a singer/songwriter and actress, which one came first? Everyone thinks of me as an actress first, but songwriting was always my true passion. It came way before. However it’s hard to become public with it, so I’ve pursued acting to get in the public eye and then be able to make my music known. -Do you find it difficult writing music many of your fans can relate to being that you’re only 13? No. Being 13 actually helps me write music that teenage girls can relate to. My music is real because it comes from personal experience. Every teen girl has the wrong guys that they have crushes on. “You’ll Know” is relatable because all of us girls want a down-to-earth guy who likes us for who we truly are. Someone we can be ourselves with. -What has been the most difficult song for you to write or which one is the most personal to you? In every song I write I share a little piece of myself, so they’re all personal. -Is it harder filming show/movie or a music video? What are the main differenced? Movies and music videos are a lot of fun to work on! TV shows and movies are exciting and challenging because you’re playing a part or a character different than yourself. Working on my music video was even more exciting because I’m not playing a role or character. I can totally be myself. And because I get to perform what I’ve written, I could feel it and really get to express myself. -We’ll also be seeing you on the big screen soon, can you tell us about your new film ‘Broken Vows’? “Broken Vows” is an amazing psycho thriller. I don’t think my parents will let me see the final version. Lol Jamie Alexander and Wes Bentley rock. I was lucky to work with such professionals. My part of Daisy is small, but I’m happy. You have to start somewhere! -It might be February already, but the year’s still new, what do you hope to accomplish in 2015? 2015 is gonna rock! I’ll be graduating from 8th grade and getting ready to go to high school. I’ll also be working on my EP which is so cool. During my downtime I’ll be playing with my dogs and I’m going to Maine this summer… where I just know I’ll be inspired to write so many new killer songs! -Besides your new film, you’ll also working on an EP…what can fans expect to hear? Expect to hear more songs from my heart with a variety of beats: from kick-back cool to downtown tempos. -What’s the process like to record an EP? How do you choose which songs to put on and which ones to save for later? It’s super fun to record because I get to spend hours and hours with some super cool people in the recording studio. I don’t consider it work because it’s way too much fun and I love singing. We record a lot of songs and then we listen to them and like I always say, “you’ll know” when the right song comes along. It comes from my heart. -Do you have a message for all your friends, family and fans? Live, love and laugh a lot. I thank my fans and family for believing in me and I won’t disappoint. -Finally, can you share with us your social medias and also where people can find your music?